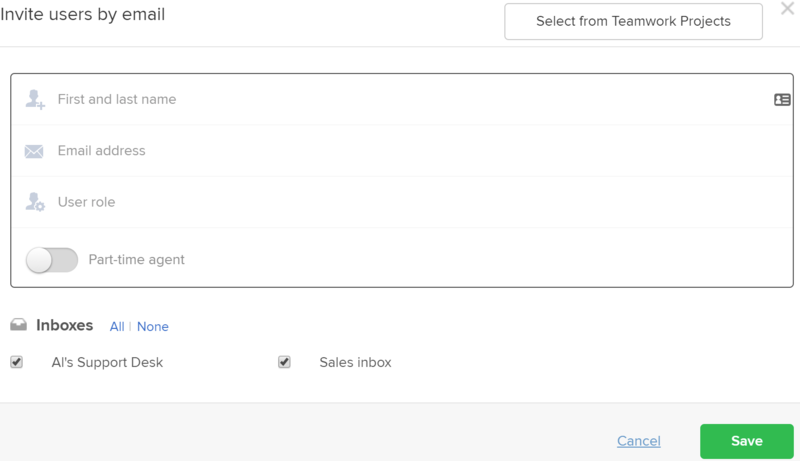 Within Teamwork Desk you can add new users to your site at any time. Note: A agent (user) and an inbox cannot have the same email address. Click on your profile icon to the top right of the navigation bar and select Settings. Near the top of the page select the Users tab. To the top right corner you will see the green Invite Users button. This will bring up the Add New Users modal. Enter the user’s name, add their e-mail address and role. Select if you want them to be a part time agent, if you do not select this they will be considered a full time user. If you have a Teamwork Projects account, you will also be able to use the 'Select from Teamwork Projects' option in the upper right hand corner to add existing members there. Any invite you send will expire after 24 hours. Note: When you create a new user in Desk, that user will automatically also be added as a collaborator in Projects. The user will be able to log in to your Projects site but they will not have access to anything, by default.